Suppose that seven students have the following number of pets: 4, 8, 1, 2, 1, 4, 1. 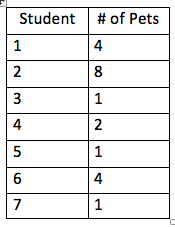 Answer the following questions based upon the data from the table. What is the mean (average) of the data set? What is the median (middle) of the data set? What is the mode (# that appears most often) of the data set? What is the range of the data set? Please show all of your work.